Romero banners at Francis' «Angelus» event at the Vatican. Let’s be frank: Pope Francis is the best thing to happen for Óscar Romero. But let’s also be clear: the reason why Francis is so good for the memory of the slain Salvadoran archbishop (1917-1980) is not that Francis has advanced Romero’s beatification cause (though he has) or that Francis has validated Romero by taking social stances reminiscent of Romero (though he has also done that). The greatest thing Francis has done for Romero is to attract the contempt of the right, showing the world that being painted as a Marxist for espousing the social gospel is badge of honor, not a cause of shame. Romero supporters have much to be thankful for in Francis’ pontificate so far. Cardinal Jorge Mario Bergoglio’s views about Romero were known in the inner circles before he was even Pope. In May 2007, Cardinal Bergoglio told a Salvadoran cleric, “If I had been pope, the very first thing I would have done is order the beatification of Archbishop Romero.” According to reports, the Argentine had come in second behind Joseph Ratzinger in the 2005 conclave. But on March 13, 2013, the Argentine became Pope Francis, and on April 20 he let it be known that he had “unblocked” the Romero beatification. During his years as Archbishop of Buenos Aires, Card. Bergoglio attended several ceremonies paying tribute to Archbishop Romero in events organized by the Sant Egidio community of Argentina, in the framework of the ecumenical commemoration of twentieth century martyrs. For example, in the 2005 commemoration of Romero and others, held at the Buenos Aires Cathedral, Card. Bergoglio railed against the “greatest evil that can happen to the Church of the Lord: spiritual vulgarity—when we enter into accommodations with the schemes of this world.” When Card. Bergoglio led a delegation of Argentine bishops to Rome in 2009, they visited the Basilica of St. Bartholomew on Tiber Island, which pays tribute to twentieth century martyrs, including Archbishop Romero. The Argentine Pontiff has said that he chose the name “Francis,” in honor of St. Francis of Assisi, because of the beloved saint’s association with the poor and the environment. “How I would like a Church which is poor and for the poor!,” he declared within days of being elected. For his part, Romero is best recalled as a champion of the poor, who sought to be the voice of the voiceless: “We are never ashamed to say the Church of the poor,” he insisted. Because Francis hails from Latin America, says Honduran Cardinal Óscar Andrés Rodríguez Maradiaga, a close advisor to the Pope, he knows how the other half lives. “For us, poverty is concrete people, concrete faces of people — people who suffer, people who are living in slums, people who are in prison, people who are deported, people who are in refugee camps,” says the prelate. Cardinal Rodríguez, an avowed Romero admirer, says that it was “the constant seeking of the will of God that led him to face bravely the structural sin that was crushing the little ones of his dear country.” According to the Honduran cardinal, “Francis analyzes the economy from the point of view of the poor which is in line with Jesus’s perspective.” Moreover, says Rodríguez, “Francis recognizes in those unjust structures an illness of the system as such.” An illness which the Pontiff—like Archbishop Romero—consistently denounces. Perhaps the greatest validation Pope Francis has brought to Archbishop Romero is to put the slanders against the Salvadoran martyr in context in the way that the Pontiff has become a lightning rod for ideologues. For years, the greatest stumbling block in Romero’s path to beatification was the perception that he was Marxist-tainted or affiliated with the “socialist” current of Liberation Theology. Francis has largely obliterated that stain by showing that ideological critics will bristle even at fair criticism of capitalism (they had similarly attacked Paul VI), and are not too shy to attack even the Pope. The American conservative radio talk show host Rush Limbaugh dismissed Pope Francis’ criticism of capitalism as “pure Marxism coming out of the mouth of the pope.” Limbaugh accused Francis, among other things of using Marxist terms like “unfettered capitalism” to describe the world economy. “Unfettered capitalism? That doesn’t exist anywhere. Unfettered capitalism is a liberal socialist phrase to describe the United States.” Even a Harvard University’s Kennedy School of Government scholar criticized Francis for supposedly “promoting envy” of the rich while discouraging entrepreneurship and innovation. “Encouraging people to measure themselves against others only leads to grief,” wrote Lant Pritchett. “Resenting the success of others is a sin in itself.” Similarly, Loyola Marymount (a Catholic institution) professor David Byrne admitted that he “cringed” at the echoes of Liberation Theology in the Pope’s exhortation «Evangelii Gaudium». In light of these words of Jesus, the revulsion from certain quarters inspired by Romero and the Pope are no cause for shame, but rather they are confirmations of authenticity and badges of courage. By attracting the same venom and contempt as the abused Salvadoran, Pope Francis is helping the Catholic world to understand Romero. Global distribution of Catholicism, (c) Pew Research Center, 2010. The Traditionalist site Rorate Cæli recently diagnosed “the collapse of Catholicism in Latin America” and attributed the downfall to the Second Vatican Council and to the brand of Catholicism espoused by Latin American clerics such as Pope Francis. Not only is the analysis wrong about the perceived failure of Latin American Catholicism, but it risks leading readers to miss the valuable lessons that the greater Catholic world can learn from the Latin American Church—lessons that Pope Francis has begun to implement at the Vatican. Ironically, the Rorate analysis is wrong, in part, because it engages in a type of thinking specifically condemned by Latin American ecclesiology and criticized by Pope Francis—a kind of self-absorbed way of looking at the world that the Pope calls being “self-referential.” In a speech before he became Pope, then Cardinal Jorge Mario Bergoglio said that, “The evils that, over time, happen in ecclesial institutions have their root in self-referentiality and a kind of theological narcissism.” It requires “self-referentiality” to conclude that the downward trends in Latin American Catholicism were caused by the Second Vatican Council—ignoring similar trends worldwide at the same time among many other religions. The web site, keen on the use of Latin, also falls into the fallacy that is still known by its Latin handle: Post hoc ergo propter hoc (“after this, therefore because of this”)—the folly of thinking that because something happens later in relation to something else, that the first thing causes the second. Rorate reasons: (a) Vatican II occurred in the 1960s; (b) the 13 point drop in Latin American Catholicism for 1995-2013 postdates Vatican II; therefore (c) Vatican II caused the 13 point drop. In fact, the trends observed during the period in question have been in motion for much longer than said period and predate the Council. Perhaps the most mesmerizing oversight in the Rorate piece is the failure to acknowledge—and accommodate in their analysis—the fact that Latin America is among the most thriving sectors of the Church, and that this was true before the advent of the Argentine Pontiff. True, not all of this success is a result of strategic brilliance—in fact, the Church in the region started out with colossal advantages, being the state religion in several countries, and having near 100% adherence in many others. But the preference for a game plan evidenced in the Aparecida document harkens back to 1899, when Leo XIII convened the first Plenary Council of Latin American bishops. Later, the Ven. Pius XII, in his 1955 Apostolic Letter Ad Ecclesiam Christi, outlined the Latin American Church’s action plan. Pope Pius noted: (1) the insufficient numbers of clergy; (2) the incursions of various competing ideologies, including Protestants, Freemasons, and Secularists; and acknowledged (3) the potential of Latin America to serve as an evangelizing model for the rest of the Church based on its response to these challenges. Rorate points to the rise of Liberation Theology as one reason people may have abandoned the Church in Latin America, but even this controversial movement demonstrates the Latin American Church’s proactive streak. One of the tactics Pius proposed for the battle plan—decades before the advent of Liberation Theology—was for the Church to develop her own formula, “with sound doctrine and incessant and proactive action, in the social arena” to ward off the advance of true Communism. To look at this history is to recognize that the pressures that have acted on the Latin American Church were present before the time of the Council, and that there is a good empirical case to be made that the measures put in place by the Latin American Church have stemmed the bleeding experienced by worldwide religion, and explain, in part, the continuing vibrancy of the Latin American Church today. The lesson for the greater Church could be that it helps to have a sense of mission, to continually engage with the greater world, and to avoid self-absorption. Dreams of erecting a statue of the martyred Salvadoran Archbishop Óscar A. Romero in the Eternal City came one step closer to reality this week, when the government of Taiwan made a $38,000 donation to the Romero Foundation in San Salvador, which is spearheading the project. Msgr. Ricardo Urioste, foundation president, said he hoped that erecting the statue in Rome would “speed up” Romero’s beatification. According to an article in Avvenire, the newspaper of the Italian Bishops Conference, the plan to bring the Romero statue to “Giardino El Salvador” (El Salvador Gardens) in the EUR district of the City, is supported by the Salvadoran community, which numbers 50,000 expatriates, concentrated in various Italian cities, of which Milan is especially prominent. The City of Rome is also backing the project, together with various Italian parliamentarians who earlier this year received the speaker of the Salvadoran Congress to promote the project. Organizers hope to unveil the work, by Salvadoran sculptor Guillermo Perdomo, in October. A new book by Rachele Zaza Padula entitled “Oscar Arnulfo Romero” and described as “a tragedy in two acts” will be presented in Potenza, Italy, this week. The presentation will include a panel featuring academics and a local priest. Also in Italy, a second book entitled “Compagni di strada, in cammino nella Chiesa della Speranza” (Travel Companions on the Road to the Church of Hope) by Pierluigi di Piazza will be presented in Villa San Giovanni. The book contains profiles of inspirational figures including Romero, and the presentation will feature a large panel discussion featuring academics and community leaders. Finally, in El Salvador, the Salvadoran postal service has released postage stamps commemorating the name change of the national airport to “Aeropuerto Internacional Monseñor Óscar Arnulfo Romero y Galdámez.” The name change was announced earlier in the year by former president Mauricio Funes. Following a spate of rumors that turned out to be without basis, there now appears to be no new movement on the canonization front. Los sueños de erigir una estatua del arzobispo mártir salvadoreño Óscar A. Romero en la Ciudad Eterna se acercaron un paso más a la realidad esta semana, cuando el gobierno de Taiwán hizo una donación de $38.000 a la Fundación Romero en San Salvador, que encabeza el proyecto. Mons. Ricardo Urioste, presidente de la fundación, dijo que esperaba que la erección de la estatua en Roma podría “acelerar” la beatificación de Romero. Según un artículo publicado en Avvenire, el diario de la Conferencia Episcopal Italiana, el plan para traer la estatua de Romero al “Giardino El Salvador” (Jardines de El Salvador) en el distrito EUR de la Ciudad, cuenta con el apoyo de la comunidad salvadoreña, que numera 50.000 expatriados, concentrados en diversas ciudades italianas, entre las que Milán se perfila de manera especialmente prominente. La municipalidad de Roma también está respaldando el proyecto, como también lo hacen varios parlamentarios italianos que a principios de este año recibieron al presidente de la Asamblea Legislativa salvadoreña para promover el proyecto. Los organizadores esperan dar a conocer la obra, por el escultor salvadoreño Guillermo Perdomo, en octubre. Un nuevo libro de Rachele Zaza Padula titulado “Oscar Arnulfo Romero”, que se describe como “una tragedia en dos actos” se presentará en Potenza, Italia, esta semana. La presentación incluirá un panel con académicos y un sacerdote local. También en Italia, un segundo libro titulado “Compagni di strada, ‘n cammino nella Chiesa della Speranza” (Compañeros de viaje en el camino hacia la Iglesia de la Esperanza) por Pierluigi di Piazza se presentará en Villa San Giovanni. El libro contiene perfiles de figuras inspiradoras incluyendo a Romero, y la presentación contará con una gran mesa redonda con académicos y líderes comunitarios. Por último, en El Salvador, el servicio de correos de El Salvador ha lanzado sellos conmemorativos por el cambio de nombre del aeropuerto de El Salvador a “Aeropuerto Internacional Monseñor Óscar Arnulfo Romero y Galdámez”. El cambio de nombre fue anunciado a principios de año por el ex presidente Mauricio Funes. Después de una ola de rumores que resultó sin fundamento, ahora parece no haber nuevos movimientos en el proceso de canonización. I sogni di erigere una statua del martire salvadoregno monsignor Oscar A. Romero nella Città Eterna è venuto un passo più vicino alla realtà questa settimana, quando il governo di Taiwan ha fatto una donazione di 38 mila dollari alla Fondazione Romero in San Salvador, che sta conducendo il progetto. Mons. Ricardo Urioste, presidente della fondazione, ha detto sperare che erigere la statua a Roma poteva “accelerare” la beatificazione di Romero. Secondo un articolo di Avvenire, il giornale della conferenza episcopale italiana, il piano per portare la statua Romero a “Giardino El Salvador” nel quartiere EUR della città, è sostenuto dalla comunità salvadoregna, che numera 50.000 espatriati, concentrati in varie città italiane, tra cui Milano è particolarmente prominente. Il Comune di Roma sta anche sostenendo il progetto, insieme a vari parlamentari italiani che all'inizio di quest'anno hanno ricevuto il speaker del Congresso salvadoregno per promuovere il progetto. Gli organizzatori sperano di svelare l'opera, dello scultore salvadoregno Guillermo Perdomo, nel mese di ottobre. Un nuovo libro di Rachele Zaza Padula dal titolo “Oscar Arnulfo Romero” descritto come “una tragedia in due atti” sarà presentato a Potenza, Italia, questa settimana. La presentazione comprenderà un pannello con accademici e un prete locale. Anche in Italia, un secondo libro intitolato “Compagni di strada, in cammino Nella Chiesa della Speranza” da Pierluigi di Piazza sarà presentato a Villa San Giovanni. Il libro contiene i profili di figure ispiratrici, tra cui è Romero, e la presentazione sarà caratterizzata da una grande tavola rotonda con studiosi e leader di comunità. Infine, in El Salvador, il servizio postale salvadoregno ha rilasciato francobolli per commemorare la modifica del nome dell'aeroporto di El Salvador “Aeropuerto Internacional Monseñor Oscar Arnulfo Romero y Galdámez”. Il cambio di nome è stato annunciato all'inizio dell'anno dall'ex presidente Mauricio Funes. Dopo di una ondata di speculazioni senza fondamento, adesso non sembra esserci nessun nuovo movimento sul fronte canonizzazione. Cardinal Óscar Andrés Rodríguez Maradiaga (pictured) has emerged as one of Pope Francis’ top foils. Defending the Pope against critics who say his social pronouncements show a naiveté and failure to grasp the finer points of free market theory, Rodríguez Maradiaga hits back that the market libertarians are the ones with the knowledge gap. “Those who criticize the pope do not know the rest of the world,” the cardinal told NCR. In particular, says Rodríguez Maradiaga, they do not know the poor. Because Francis hails from Latin America, the cardinal says, he knows how the other half lives. “For us, poverty is concrete people, concrete faces of people — people who suffer, people who are living in slums, people who are in prison, people who are deported, people who are in refugee camps,” he says. Being faced with this reality, argues Rodríguez Maradiaga, forces the true Christian to look not at economic theories, but at the faces of the poor. Francis, who “has profound knowledge of the life of the poor says that elimination of the structural causes for poverty is a matter of urgency that can no longer be postponed,” the cardinal says: “The hungry or sick child of the poor cannot wait.” C.f., Pope St. John Paul II, 1987 remarks to the Econ. Comm. for Lat. Am. (“The poor can not await! Their situation demands extraordinary measures, relief that cannot be postponed: imperative assistance.”). In his Lent Message for 2014, Francis outlined the specific situation that Catholic Social Teaching calls out as the ‘structural’ sin at the root of an unjust social order. “When power, luxury and money become idols,” Francis said, “they take priority over the need for a fair distribution of wealth.” Building on that point, Archbishop Romero would go on to say that poverty was therefore a litmus for the presence of structural sin. “The existence of poverty as a lack of what is necessary is an indictment,” he said. Accordingly, by immersing herself in the world of the poor, the Church gains “a clearer awareness of sin,” Romero said. And “as the Church draws closer to people who are poor the Church understands that sin is serious,” he said. “Sin is what killed the Son of God and sin is what continues to kill the Children of God,” Romero said. Accordingly, poverty offers a self-contained catechesis: “We see that basic truth of the Christian faith daily in the situation of our country,” Romero said. El cardenal Óscar Andrés Rodríguez Maradiaga (en la foto) se ha convertido en uno de más destacados defensores del Papa Francisco. Defendiéndolo de aquellos críticos que dicen que los pronunciamientos sociales del Papa muestran ingenuidad y falta de comprensión sobre los puntos finos de la teoría libre mercado, Rodríguez Maradiaga arremete que los campeones del libre mercado son los que faltan conocimiento. “Los que critican al Papa no conocen al resto del mundo”, dice el cardenal. En particular, dice Rodríguez Maradiaga, no conocen a los pobres. Siendo Francisco de América Latina, dice el cardenal, él sabe cómo vive el resto del mundo. “Para nosotros la pobreza es personas concretas, rostros concretos de la gente — personas que sufren, personas que viven en barrios marginales, personas que están en la cárcel, personas que son deportadas, personas que están en los campamentos de refugiados”, insiste. Otro Óscar — Mons. Óscar A. Romero de El Salvador — vio la misma realidad hace unas décadas: “Rostros de campesinos sin tierras, ultrajados y matados por las fuerzas y el poder. Rostros de obreros despedidos sin causa, sin paga suficiente para sostener sus hogares. Rostros de ancianos, rostros de marginados, rostros de habitantes de los tugurios, rostros de niños que ya desde su infancia comienzan a sentir la mordida cruel de la injusticia social”, dijo Romero. Insistió en que “Nuestro mundo salvadoreño no es una abstracción”. Más bien, “es un mundo que es su inmensa mayoría está formado por hombres y mujeres, pobres y oprimidos”. Estar frente a esta realidad, argumenta Rodríguez Maradiaga, obliga al cristiano verdadero a no mirar las teorías económicas, sino a las caras de los pobres. Francisco, que “tiene un profundo conocimiento de la vida de los pobres, dice que la eliminación de las causas estructurales de la pobreza es una cuestión de urgencia que ya no se puede postergar”, dice el purpurado: “El niño hambriento o enfermo de padres pobres no puede esperarse”. Comparece el Papa San Juan Pablo II, declaraciones de 1987 a la Com. Econ. para Am. Lat. (“¡Los pobres no pueden esperar! La situación de éstos está pidiendo medidas extraordinarias, socorros impostergables, subsidios imperiosos”). En un discurso de 2002, Rodríguez Maradiaga afirmó que Mons. Romero había respondido a la llamada y se sintió interpelado por la urgencia de la realidad de los pobres: “la suya no fue una conversión en el sentido habitual del término, un apartarse de la senda equivocada hacia el camino correcto”, dijo Rodríguez Maradiaga. “Fue, más bien, la búsqueda constante de la voluntad de Dios que le llevó a enfrentar con valentía el pecado estructural que estaba aplastando a los más pequeños de su querido país”. En su Mensaje Cuaresmal del 2014, Francisco expuso la situación específica que la doctrina social católica llama pecado estructural de raíz que establece un orden social injusto. “Cuando el poder, el lujo y el dinero se convierten en ídolos”, dice Francisco, “se anteponen a la exigencia de una distribución justa de las riquezas”. Sobre ese punto, Mons. Romero llegó a decir que la pobreza es, por tanto, un diagnóstico de la presencia del pecado estructural. “La existencia, pues, de la pobreza como carencia de lo necesario, es una denuncia”, dijo. Entonces, sumergiéndose en el mundo de los pobres, la Iglesia “recobra un sentido más claro de lo que es el pecado”, dijo Romero. Romero expuso sobre el significado del pecado estructural en su segunda carta pastoral, en la que lo definió como “aquellas estructuras sociales, económicas, culturales y políticas que marginan eficazmente a la mayoría de nuestro pueblo”. En cierto sentido, Romero argumentó, las denuncias de la Iglesia no son nuevas: “Propiamente la Iglesia ha denunciado durante siglos el pecado”, incluyendo el pecado que corrompe las relaciones entre individuos. “Pero ha vuelto a recordar lo que, desde sus comienzos, ha sido algo fundamental: el pecado social, es decir, la cristalización de los egoísmos individuales en estructuras permanentes que mantienen ese pecado y dejan sentir su poder sobre las grandes mayorías”. Y “En su acercamiento a los pobres, la Iglesia comprende que el pecado es cosa grave”, pronunció. “Pecado es aquello que dio muerte al hijo de Dios y pecado sigue siendo aquello que da muerte a los hijos de Dios”, dijo Romero. En consecuencia, la pobreza ofrece una catequesis auto- contenida: “Esa verdad fundamental de la fe, la vemos a diario en situaciones de nuestro país”, dijo Romero. Al igual que Romero, “Francisco analiza la economía desde el punto de vista de los pobres, que está en línea con la perspectiva de Jesús”, dice Rodríguez Maradiaga. Y “Francisco reconoce en esas estructuras injustas una enfermedad del sistema como tal”. Il Cardinale Óscar Andrés Rodríguez Maradiaga (nella foto) ha emerso come uno dei migliori defensori di Papa Francesco. Difendendo il Papa contro i critici che dicono che le sue dichiarazioni sociali mostrano una ingenuità e l'incapacità di cogliere i punti più delicati della teoria del libero mercato, Rodríguez Maradiaga risponde che i sostenitori del mercato sono quelle con il divario di conoscenze. “Coloro che criticano il papa non conoscono il resto del mondo”, disse il cardinale. In particolare, dice Rodríguez Maradiaga, non conoscono i poveri. Perché Francesco proviene dall'America Latina, il cardinale dice, lui sa come vive l'altra metà. “Per noi, la povertà è la gente concreti, volti concreti di persone—le persone che soffrono, le persone che vivono negli slum, le persone che sono in carcere, le persone che sono deportati, le persone che si trovano nei campi profughi”, dice. Un altro Óscar— l’arcivescovo Óscar A. Romero di El Salvador—ha visto un simile realtà decenni fa: “volti dei contadini senza terra maltrattati e uccisi dalle forze del potere, volti di lavoratori arbitrariamente licenziati e senza un salario di sussistenza per le loro famiglie, volti delle anziani, volti di emarginati, volti di abitanti degli slum, volti di bambini poveri che dalla prima infanzia iniziano a sentire il pungiglione crudele ingiustizia sociale”, ha detto Romero. Ha insistito sul fatto che “il nostro mondo in El Salvador non è un’astrazione”. Piuttosto, “È un mondo fatto nella stragrande maggioranza delle donne e degli uomini poveri e oppressi”. Essere di fronte a questa realtà, sostiene Rodríguez Maradiaga, costringe il vero cristiano di guardare non alle teorie economiche, ma i volti dei poveri. Francesco, che “ha una profonda conoscenza della vita dei poveri dice che l'eliminazione delle cause strutturali della povertà è una questione di urgenza che non può più essere rimandata”, dice il cardinale: “Il bambino affamato o ammalato dei poveri non possono aspettare”. Cf, Papa S. Giovanni Paolo II, osservazioni al Econ. Comm. per Lat. Am. 1.987 (“I poveri non possono aspettare; la loro situazione richiede misure straordinarie, rilievo che non può essere rinviato; un’assistenza imperativa”). In un discorso del 2002, Rodríguez Maradiaga ha affermato che Mons. Romero aveva risposto e si sentiva chiamato a reagire all'urgenza della realtà dei poveri: “la sua non era una conversione nel senso usuale del termine, di trasformare dalla strada sbagliata su il percorso corretto”, ha detto Rodríguez Maradiaga. “È stato, invece, nella costante ricerca della volontà di Dio che lo ha portato ad affrontare coraggiosamente il peccato strutturale che schiacciava i piccoli del suo caro Paese”. Nel suo messaggio per la Quaresima 2014, Francesco ha illustrato la situazione specifica che la Dottrina Sociale della Chiesa riconosce come il peccato 'strutturale' alla base di un ordine sociale ingiusto. “Quando il potere, il lusso e il denaro diventano idoli”, ha detto Francesco, “si antepongono questi all’esigenza di una equa distribuzione delle ricchezze”. Su questo punto, Mons. Romero avrebbe continuato a dire che la povertà era quindi una cartina di tornasole per la presenza del peccato strutturale. “L'esistenza della povertà come mancanza di ciò che è necessario è un atto d'accusa”, ha detto. Di conseguenza, immergendose nel mondo dei poveri, la Chiesa incontra “una più chiara consapevolezza del peccato”, ha detto Romero. Romero ha esposto sul significato del peccato strutturale nella sua seconda lettera pastorale, dove lo ha definito come “quelle strutture sociali, economiche, culturali e politiche che hanno messo la maggioranza del nostro popolo sui margini della società”. In un certo senso, Romero sostenuto, le denunce della Chiesa non sono una novità: “Nel corso dei secoli la Chiesa ha, giustamente, ha denunciato il peccato”, tra cui il peccato che corrompe le relazioni tra gli individui. “Ma lei ha cominciato a ricordare ora qualcosa che, all'inizio della Chiesa, è stato fondamentale: il peccato sociale—la cristallizzazione, in altre parole, dei peccati individuali in strutture permanenti che mantengono il peccato in essere, e fare la sua forza a farsi sentire da la maggior parte delle persone”. E mentre “la Chiesa si avvicina ai poveri la Chiesa comprende che il peccato è una cosa seria”, ha detto. “Il peccato è ciò che ha ucciso il Figlio di Dio e il peccato è ciò che continua a uccidere i figli di Dio”, ha detto Romero. Di conseguenza, la povertà offre una catechesi auto contenuta: “Guardiamo questa verità fondamentale della fede cristiana nella situazione di ogni giorno del nostro paese”, ha detto Romero. Come Romero, “Francesco analizza l’economia dal punto di vista dei poveri che è in linea con la prospettiva di Gesù”, ha detto Rodríguez Maradiaga. E “Francesco riconosce in quelle strutture ingiuste una malattia del sistema in quanto tale”. 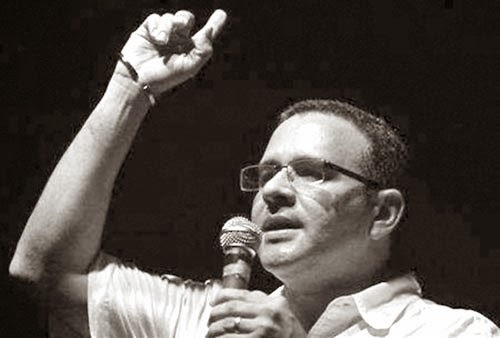 “Les guste o no les guste”—como solía decir el ex mandatario salvadoreño—el quinquenio de Mauricio Funes Cartagena como Presidente de El Salvador estará por siempre ligado de alguna manera con la figura de Mons. Romero. De hecho, ha sido Funes, cuyo mandato finalizó este domingo 1ero de junio, quien elevó a Mons. Romero a nivel de símbolo patrio, declarándolo “guía espiritual de la nación” y referente de su gobierno. Funes renombró el aeropuerto internacional de El Salvador en honor al arzobispo martirizado 34 años atrás, nombró el proyecto de construcción más importante de su mandato (una nueva vía arterial) en su honor, y hasta nombró la sala de honor de la Casa Presidencial por Romero, colgando un imponente retrato del prelado en ese lugar. Estas iniciativas provocaron la burla de la derecha y el escepticismo de la izquierda. Después del renombramiento del aeropuerto, corrió un chiste por las redes sociales que decía más o menos así. “Vivo en El Salvador. Para visitarme, debes llegar al Aeropuerto Mons. Romero, tomar la Autopista Mons. Romero, hasta la Avenida Mons. Romero de la Colonia Mons. Romero y seguir sobre la Calle Mons. Romero…” Desde la derecha, se le acusó al mandatario sufrir de una obsesión o de una contundente falta de originalidad. Desde la izquierda, Funes siempre será perseguido por la tira cómica del caricaturista político salvadoreño Otto, quien reclamó a Funes por supuestamente traicionar su devoción a Romero, vendiéndose a pactos políticos para preservar o extender el poder (a cuales Mons. Romero presuntamente nunca se hubiera dado). 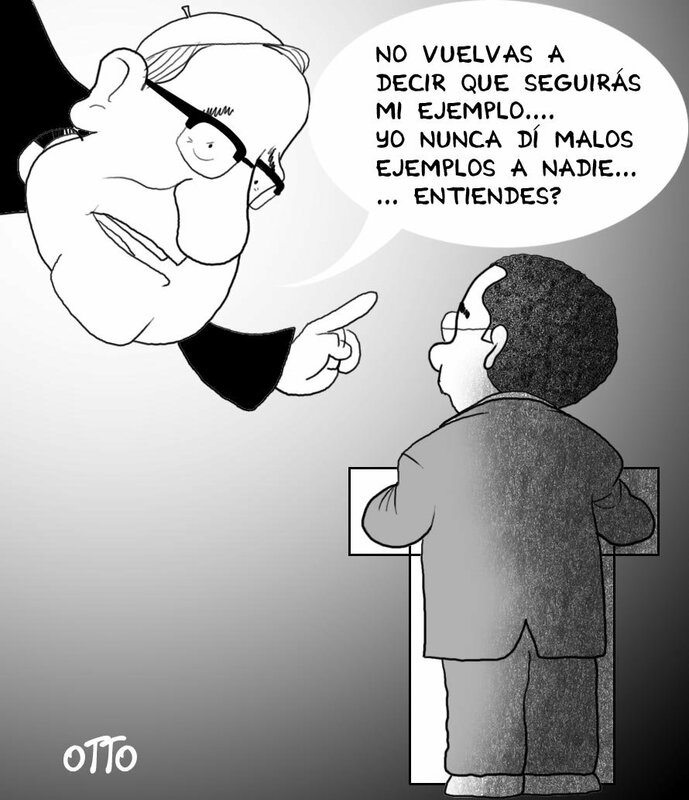 En un cuadro caustico, el caricaturista presenta a Funes reprendido por el espíritu de Romero: “No vuelvas a decir que seguirás mi ejemplo … Yo nunca di malos ejemplos a nadie”, le dice desde lo alto. Quizá el punto más craso de la relación entre Funes y Romero llegó el año pasado, cuando Funes hizo colgar carteles de publicidad en San Salvador que buscaban reforzar la imagen de su gobierno, posters en que la imagen de Mons. Romero acompañaban al logotipo del gobierno Funes, con el eslogan “Por el rumbo señalado por Monseñor Romero”. Esta explotación propagandística de la figura de Mons. Romero hacía pensar que las alusiones al popular arzobispo habrían sido meramente una estrategia, una manipulación calculada, y no una autentica solidaridad o simpatía con su causa y con su espiritualidad. Pues, ¿cómo armonizar estas notas contradictorias? ¿Es Mauricio Funes un buen discípulo de Mons. Romero, o más bien un falso y oportunista evangelizador? Aquí yo propongo usar una figura histórica para profundizar sobre el alcance y naturaleza del efecto Funes sobre el legado Romero. La figura que me viene en mente es el emperador Constantino, el que oficializó el cristianismo como la nueva religión estatal del imperio Romano, después de siglos de persecución de esta “secta ilegal”. Los historiadores se debaten los motivos del emperador, y la sinceridad de su actuar. Incluso, se discute si Constantino dio un espaldarazo que verdaderamente ayudó al cristianismo a llegar a ser la religión mayoritaria siendo una minoría, o si el emperador sencillamente reconoció a tiempo lo que estaba por llegar y se puso de parte de los victoriosos con antelación. Pero el hecho es que, aparte de estos debates, no cabe duda que Constantino fue el cauce a través del cual se dio un salto cuántico en el desarrollo de la institucionalidad cristiana. Su persona marca un antes y después en la historia de la cristiandad. Y de la misma manera, el Presidente Funes ha sido el político que llevó a Mons. Romero desde un símbolo popular hasta una figura épica nacional, como la del patriarca del país. Mauricio Funes no ha sido un apóstol perfecto de Mons. Romero. También sufre la desventaja de tener que ser juzgado por su accionar en el mundo imperfecto de la política, donde se negocia y se pacta la componenda, mientras que Mons. Romero está siendo levantado como un mito, un ideal, y un hombre que se está pasando por un tipo de apoteosis: pasando de ser un hombre a ser un súper-hombre, según las leyendas populares y su proceso de canonización. Sin embargo, Mauricio Funes ha sido el presidente salvadoreño que identificó a Mons. Romero como un símbolo patrio, y lo colocó al centro de su discurso nacional.